Fallen fruit on Datscha-Radio garden’s grounds. Should we dump them in the composter? Good idea – but today we’ve got a better one. For each rotting apple, each worm-bitten plum has hidden talents. Musical talents indeed! And Karl Heinz Jeron will show us how to bring these talents on stage. Thus, hush hush to the next deli, to the market or the nice little restaurant round the corner. Or ask your neighbour. Or would it make sense to take a look in your own kitchen? Well: To re-think your own practice is nice – talk to others about the sad fate of despised nutrition carriers is even better. Who knows, perhaps they’ll join us for what’s next. For the Datscha-Radio garden, however – with all its wonderfull trees full of plums and apples and all the beds overloaded with fresh veggies providing rich vitamin meals for all of us every day, so bringing whatever kind of foreign fruit to the garden would seem ridiculous – we’ll have to adapt the concept. We’ll ask the neightbours for fallen fruit. And we’ll also collect some in the Datscha garden. 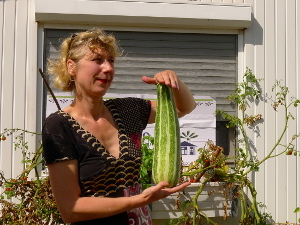 Fruit, for at least today rotting veggies are not available – look at the grand zucchini Ms. Schaffnerin found instead! Yes, this will go to the kitchen later and become part of a delicious dinner. What a pity: No rotten parts, no music (ok, it would work with fresh fruit as well – but that’d be not fresh music for rotten veggies, right?). 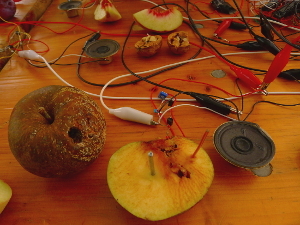 While Karl Heinz is cutting apples, placing plums and other pieces people have brought to the garden table, putting a zinc and a copper rod into each of the fruit, then wiring them and connecting everything with speakers and other stuff, we’re posing curious questions: What is this good for? Why that? What if… ah, and what will be the results? But hey, we can already listen to the latter. Indeed, these fruit are extraordinary talented! They are generating sounds! However, for sure not because the maggots have started to sing. But because the fruit are feeding the circuit with energy (that’s what fruit are supposed to do, also when consumed by humanimals, right? 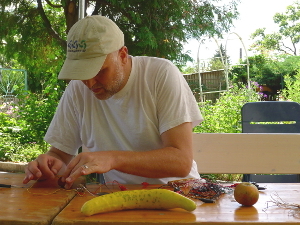 ): Each fruit has become a battery – a principly we should remember from school lessons, yes: the good old lemon battery (yet Karl Heinz can confirm that potatoes work even better). 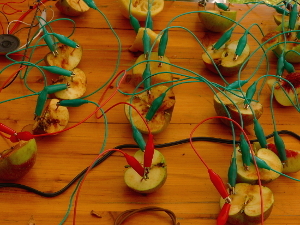 Put in parallel and connected in series, step by step our fruit battery is growing to a symphony orchestra. Indeed, meanwhile the sounds have become louder, and the composition has become quite articulate and rich. Thus we finish our talk about the idea of punk (see the title of the piece, an hommage to the Dead Kennedys and their legendary first album, “Fresh Fruit for Rotting Vegetables” – to which the Datscha-Radio version fits even better), about post-industrial (for we’ve not played Dead Kennedys, but a piece by Throbbing Gristle as the intro for the show), about aleatorics, chance music and John Cage (a curious cook himself and thus perfectly fitting into our table talk), about DIY, recycling, batteries and rotting data, hardware, software – and clear the stage for the orchestra. 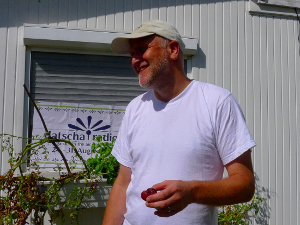 Great many thanks to Karl Heinz Jeron for his radiophonic live workshop on “Fresh Music for Rotten Vegetables Fruit”, the table talk – and the delicious zucchini dinner in the Datscha-Radio garden. Karl Heinz Jeron is an artist living and working in Berlin. Find out more about “Fresh Music For Rotten Vegetables” and his other projects by visiting his hompage.